Nick Wolf is a public research specialist for NorthAm Oil Company, but he likes to think of himself as the company storyteller. Nick, who believes in the old-fashioned integrity of the people who run NorthAm, is sent to scout potential oil exploration/drilling sites to assess the political climate. His latest assignment sends him to Hatteras Island, on North Carolina's Outer Banks. Growing up, Nick's grandmother used to whisper the name of the island "like a hissing curse that shouldn't be spoken out loud." Nick's grandfather was said to have died on Hatteras during World War II, though he was mysteriously claimed as a fallen soldier by both the American and German armies. As soon as he arrives on the island, Nick is the victim of several suspicious accidents and begins receiving cryptic notes that lead him to surprising revelations about his grandfather. In the course of his research for NorthAm, Nick discovers that four families run everything and everyone is somehow connected. Even Julia Royal, the fascinating and frustrating woman who runs the boarding house where Nick is staying, is the granddaughter of perhaps the most powerful patriarch of the four families--Liam Royal, known as The Founder. This mystery/thriller follows two intriguing storylines. Contemporary politics of the Outer Banks, including the always-controversial question of offshore drilling, interweave with the history of German saboteurs during World War II. 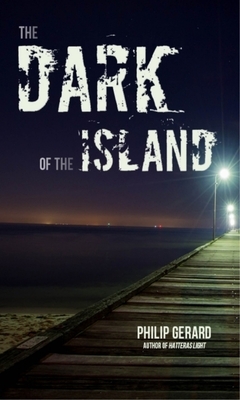 The book's title--The Dark of the Island--is what the old-timers on Hatteras called a moonless night with no stars. It was on these nights that the "mooncussers and wreckers" would raise a false light on the beach luring an unwary ship's captain to run aground so the locals could row out to the wreck and loot the cargo. In this novel, it's Nick Wolf's destiny to discover what is behind the true "dark of the island." Philip Gerard is the author of five novels and eight books of nonfiction, including Down the Wild Cape Fear: A River Journey Through the Heart of North Carolina and The Patron Saint of Dreams, winner of the 2012 North American Gold Medal in Essay/Creative Nonfiction from The Independent Publisher. "Greed, regret, deceit, and betrayals drive the mystery, but Gerard's addition of a realistic love story and his literary, often emotionally charged, writing make this a worthwhile read." --Foreword Reviews.